Horse Racing Odds are numerical representation, normally expressed as a pair of numbers. They are usually used to express the possibility of an event occurring or taking place. They will usually be expressed in two ways: as fractions or the most recent introduction, as decimals. When the horse racing odds will be displayed in fraction form, they will appear in the format 4/1 or in other instances written as 4-1. In spoken form, this will be pronounced as four to one. Fractional odds are simply maths. To show more examples on the same, let’s call every number a unit. 4-1: This simply means for every 1 unit that you shall stake, you will receive 4 units in the event you win plus the amount you stake. Likewise, 7-2 means for every 2 units that you stake, you shall receive 7 units in the event you win your bet plus the amount you stake. Suppose you come across a ¼ fractional bet, what does this mean? Well, it simply means that the horse in question has a higher probability of winning the race. This kind of odds are referred to as the odds-on. 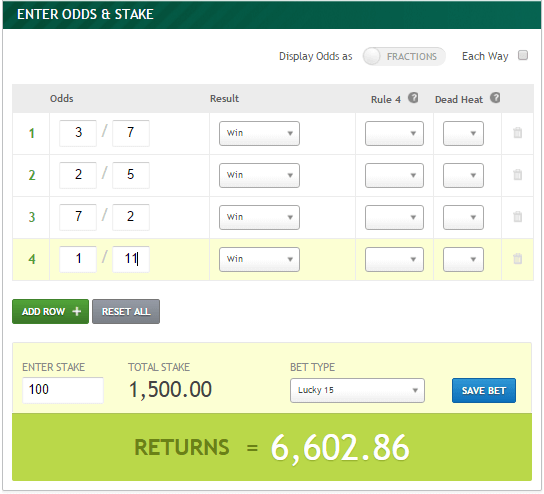 The decimal odds are the other common form that you will come across in most of the horse racing odds calculator. They will usually be displayed in the form of 5.00. When using the decimals in the horse racing odds calculator, you will simply multiply the amount you stake with the odds. If you stake $20, then on the horse racing odds calculator, you will multiply $20 × 5 to get a total horse racing odds calculator payout of $100. Just like a football match has a favorite, every horse racing event has a favorite. 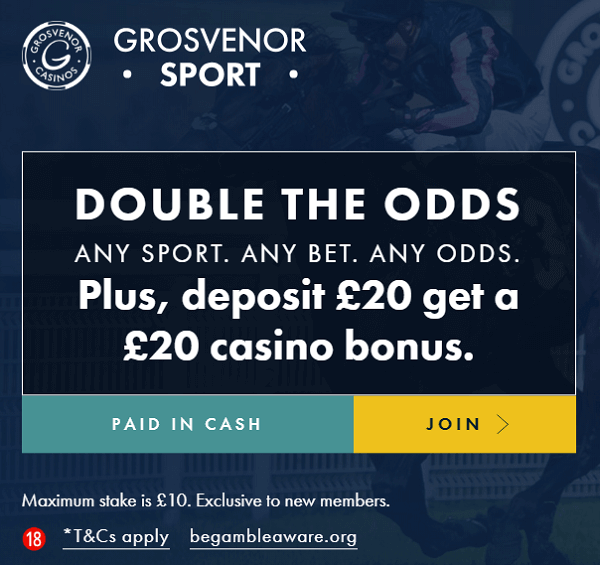 In most cases, this is the horse with the highest chance of winning the race and will usually be reflected by having the shortest price shown with the online casino or the bookmakers. In most instances, you will see an F alongside the horse that has the highest chance of winning the race. If there are more than one horse that is a favorite too winning the race, there will be a JF symbol besides the horse meaning that they are Joint Favorites of winning the race. Exotic bets, or wagers as they are sometimes referred to, are bets that allow you to place more than a single bet on an event thereby increasing your profit margin. Unlike the simple bets, the exotic bets require one to have experience and better understanding on how to choose a race and moreover a horse. They are a little difficult to win as compared to the straight bets, they are a little expensive as well as requiring more knowledge on handicapping the horses. There are various types of exotic wagers. The Exacta – is one of the type and you shall be betting that the horses will come in first and second position. Therefore, if you placed an exacta bet on horse 4 and 7, your bet will only win if horse #4 comes in the first and horse #7 comes in second. This type of bet is very popular among the skilled horse handicappers since they have very good horse racing odds. Additionally, you can choose to “box” your exacta wager, meaning that the two horses that you are placing your money on can still come in any position. This however has very low odds in the horse racing odds calculator payout. 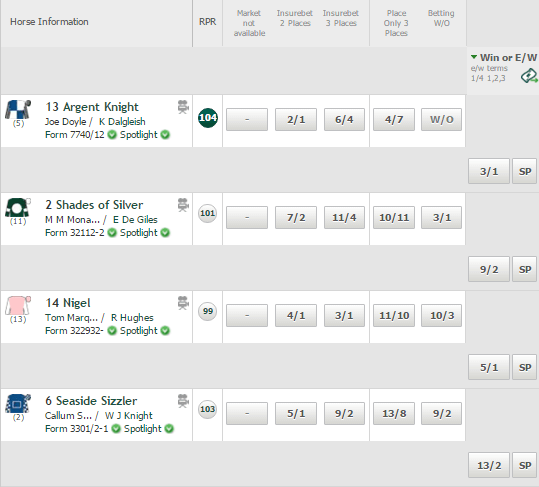 The Quinella bet involves betting on two horses to finish first or second in any order. In this bet, as long as the two horses that you’ve placed your bet on finish in the top two places, you win the bet placed. The Trifecta bet is another popular bet with the professional horse racing bettors. In this, you shall be betting that the three horses in question shall finish first, second and third in the exact order. If you place a $5 trifecta bet on 2-5-6, you will only win if the horse 2 comes in first, horse 5 comes in second and horse 6 comes in third. The Superfecta – is also another type of exotic bet where you will be predicting that four horses will finish in the first, second, third and the fourth position in the exact order. Just like the exacta, you can decide to box your superfecta bet at an extra cost. 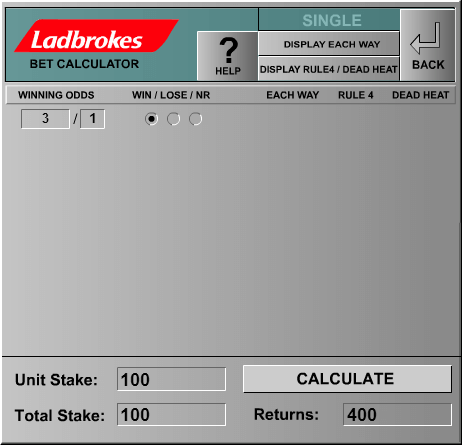 Horse racing odds calculator each way is a type of bet that is offered by most of the bookmakers and is normally made up of two different bets; the place bet and the win bet. These two types of bets are basically the straight horse racing bets. In the Place bets, you shall be betting on a horse to come second in the racing event. When you place a win bet, you win the bet when the horse comes first or second in the race. What is a Horse Racing Odds Calculator Lucky 15? 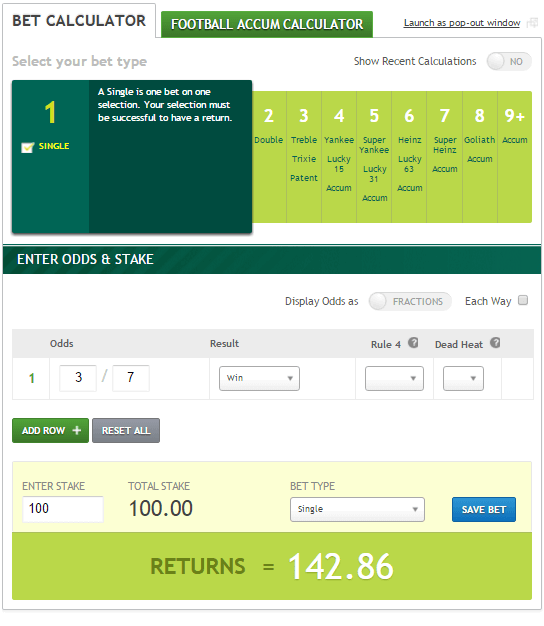 A horse racing odds calculator lucky 15 is bet calculator used to calculate the lucky 15 bet. The lucky 15 bet a four selection bet that is made up of 15 bets broken down into the a four-fold accumulator, 4 trebles, 6 doubles, and 4 singles. The 15 in the bet is derived from the fact that the bet is made up of 15 bets, while the lucky part derives its name from the fact that it is frequently the target of the bookmakers’ bonuses, with the most common form being the winner bonus, a winner consolation bonus and a loser bonus. The bonuses will normally take the form of a percentage increase in the returns or increased odds for the case of the single winner consolation.